1. Deseed a 2cm chunk of the cucumber and dice it. Cut the remaining cucumber (seeds and all) into chunks. Put into a blender (or smoothie maker) with the pepper, tomatoes, 25g bread and most of the chives. Shake the dressing, measure 2 tbsp into the blender and season generously. Whizz until completely smooth. 2. Toast the sourdough slices and set it on a board with the cheese. 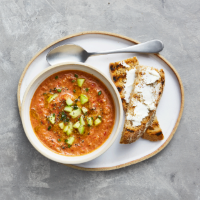 Ladle the soup into bowls and scatter with the diced cucumber and more snipped chives. 3. Dress each bowl with about 1 tsp settled oil from the top of the dressing bottle, a pinch of black pepper and few flakes of sea salt.